In 1945, in a famous lecture called “What is a Classic?,” T.S. Eliot described Virgil as the most truly classical of all poets, on the grounds that his work supposedly exemplifies a supreme “maturity of language,” which involves a total exclusion of individual personality. In English literature, Eliot claims that Shakespeare and Milton, while undoubtedly “great,” are not “classics,” because they write too much like themselves: they fail to achieve the disciplined exclusion of the self from language, which Pope, though less “great,” does manage. Eliot’s arguments are debatable on many grounds. Most obviously, one might well wonder why the exclusion of the personal should be thought a good thing. Why must writers dress their language down in the equivalent of a gray business suit? But more specifically, Eliot’s account of Virgil himself is highly questionable. He makes the Aeneid sound a lot more boring than it actually is. This is a Virgil without his moments of weird magic and even whimsy (think of the scene in Book Nine, when the Trojan ships suddenly get transformed into sea nymphs). It is a Virgil without the strangeness, the creepiness, and the intensity of his descriptions: the storms at sea; the snakes that seize Laocoön and his sons in Book Two; Dido rushing through her palace like a maenad in a play; the image of the Trojan horse as pregnant with Greek soldiers. It is a Virgil without sentimentality or homoeroticism: no mention here of Nisus’s tragic love for his doomed friend Euryalus. The one moment from the poem that Eliot cites is the scene in Book Six when Aeneas travels to the underworld and encounters Dido, who killed herself after he abandoned her (at the instigation of the gods), and who is now reunited in death with her first husband. Aeneas cries out to her, but Dido turns away, silent, giving him what Eliot calls “the most telling snub in all poetry.” Eliot reads the passage as “almost a projection of Aeneas’s own conscience”: it shows not so much how Dido feels about Aeneas as what he, in his guilt, imagines she ought to feel, and what he thinks of himself. This is a perceptive interpretation, but one that tellingly makes the subject of the poem line up with the style, as Eliot sees it: both are, above all, about repression. This “classic” would seem a lot less restrained if Eliot focused instead on Dido’s passionate rage and confusion, on the turbulent descriptions of squalls at sea, or on Aeneas’s bloodthirsty rampages on the battlefield. Eliot’s version of Virgil does not account for the multiple points of view offered by the poem, nor for its multiplicity of tone. The main value of C.S. Lewis’s “lost” version of the Aeneid is that Lewis’s Virgil is a bracing corrective to Eliot’s Virgil. (Lewis hated Eliot with a passion.) Where Eliot sees it as self-evident that Virgil’s English equivalent is the neo-classical Pope, Lewis reads the Aeneid through the medieval tradition. He preferred the lively middle Scottish translation by Gavin Douglas (which is indeed excellent) to the controlled and “classicizing” couplets of Dryden. The choice between medieval and neo-classical Virgils is both stylistic and ideological: medieval readers of the Aeneid, such as Chaucer, notoriously sided with Dido over Aeneas, and questioned the value of the imperial quest to found Rome, whereas Dryden’s version of the poem presents Aeneas’s journey as a thorny but admirable path to glory. Lewis was uninterested in the explicitly political side of this question. Instead he felt that Douglas was able to bring out the “sensuous vitality” of Virgil, which is stripped both by Dryden and by more modern translators. In a letter written in 1954, he expressed outrage at the hopeless situation of modern poetry: “The cunning devils are now translating Virgil and Sophocles into the modern style so as [to] make people believe that poetry always was the same sort of muck it is now.” Lewis saw great (and classical) poetry in general, and Virgil in particular, as offering a total sense of submersion into a magical alternative universe; and all the joy and excitement of such a gripping imaginative experience is lost if the reader is made aware of the style instead of, simply, the story. Lewis’s nostalgia for an imaginary medieval past, a world of faery that existed before the hideous time of the machines, can easily come across as wrongheaded and anti-intellectual. His Middle Ages, as he himself acknowledged, are filtered through (or invented by) the aesthetes of the nineteenth century such as William Morris, who yearned for a period before the Industrial Revolution, when craftspeople actually made things with their hands and used them, rather than being dependent on machines. From a modern perspective, Lewis’s medievalizing translation seems oddly related to the hippie movement, though of course without any awareness of such a relation. But Lewis sees his own vision as the one that is, quite simply, obvious: he uses the plonking notion of common sense to dismiss any alternative point of view. Lewis’s tone often suggests that we are all just chaps together, sitting in the pub over a good pint of beer—no need to bother now about the lunatic fringe represented by women and Americans. SO I HAVE SERIOUS reservations about Lewis’s way with Virgil. Still, I find it impossible not to be cheered and inspired by his impassioned love of reading. His defense of story and his suspicion of style bring out a question that all literary critics have to grapple with: might you spoil a book by analyzing it? Lewis’s own literary criticism (including his book on medieval love poetry, his English Literature in the Sixteenth Century, and his Preface to Paradise Lost, a fine short introduction to Milton) is arguably his best work, because in these writings he is so conscious of the need to share his own deep pleasure in literary experience. Yet the literary experience offered by C.S. Lewis’s Lost Aeneid is dubious and mixed. “Lost” is a good word for the purposes of book promotion, and it may indicate a real discovery (like the “lost” poem of Sappho, found on papyrus in 2004). In this case, however, “lost” means “totally unfinished”. A.T. Reyes, a classics schoolteacher, has labored, under the aegis of Lewis’s acolyte Walter Hooper, to gather up all fragments Lewis ever wrote that could be considered part of his proposed translation of Virgil. This includes all of Book One and a lot of Books Two and Six; but the rest is just scraps, left incomplete at the time of the great man’s death in 1963. Since then these bits and pieces have apparently been left in a drawer. They are lovingly gathered up and printed here, with facing Latin from the Loeb, and prefaced by a thorough and useful introduction by Reyes on Lewis’s vision of Virgil (which oddly includes no discussion of how Lewis’s version compares with modern translations). Fragmentary jottings toward a translation are usually not very viable in a crowded market in which several more recent and excellent poetic translations of the (whole!) Aeneid into English already exist. The versions by Robert Fagles, Stanley Lombardo, and Sarah Ruden are all very strong, and offer three distinct windows into Virgil as both a great poet and a great storyteller. Clearly, the main reason why Yale University Press believes it can market this not-quite-actual-book is that there are a large number of readers out there, especially in the United States, who see Lewis as something close to a saint. Even apart from the everlasting success of the Narnia franchise, Lewis is adored by many for his (to me, somewhat embarrassing) Christian apologetics, the best of which is The Screwtape Letters. Lewis has been appropriated as a hero of the Christian right, a role he fills somewhat uneasily. (The beer-swilling and the pipe-smoking are a problem.) Another group of people know and love Lewis as the tragic hero of Shadowlands, the sentimental tearjerker about his wife’s death from cancer. The publishers promise that this translation of Virgil will show “another side of C.S. Lewis.” It would be more accurate to say that the interest of this book lies in tracing how similar the Virgilian Lewis is to the various Lewises we already know. Most obviously, the translation, like all of Lewis’s work, shows Lewis meditating on, and recycling, his reading of English literature. Virgil’s Neptune as he stills the storm seems very similar to Shakespeare’s Prospero, addressing the “airy folk,” and warning them not to “dare/ To hope again like pardon for the like offence.” When Aeneas sees scenes from Troy depicted in Dido’s temple, Lewis recalls Milton’s summary of the subject of the Iliad: “About the walls thrice fugitive there Hector fled,” quoting Paradise Lost: “Thrice fugitive about Troy wall.” Dido’s enterprise as she builds her city in Carthage recalls the burdensome duties of Tennyson’s Ulysses as she tries to “teach justice to a savage race.” The few Trojan survivors allude to Shakespeare’s Battle of Agincourt speech from Henry V: “And we, we few.” In some ways, this approach is truthful to the spirit of Virgil, who is himself deeply allusive, not only to Homer but also to Alexandrian Greek literature and to earlier Latin epic. We might wonder, though, whether Lewis is quite as much in control of his sources. THE TENDENCY to create a collage of earlier literature is just one way in which the translation recalls Lewis’s other imaginative writing, especially his Narnia books. Like them, it creates a world that is only partly convincing, built out of other stories. Like them, it has wonderful things in it; and even more than them, it is extraordinarily patchy and uneven in tone. I say this as somebody who loved the Narnia stories as a child, and read them many times: it was partly as a result of Narnia that I later grew to love the literary models on which Lewis drew for his magical fictions, such as Spenser, Milton, and, not least, Virgil. For me, as for many others, Lewis was instrumental in teaching me how to read. Still, re-reading these books as an adult—as I have recently been doing with my six-year-old—is a complicated experience. For a start, there are things that are mostly invisible to a child, but perfectly obvious to an adult. It is hard not to be bothered by the fear or the hostility that Lewis expresses toward adult female sexuality (in those shrill, scary witches, and in the way that poor Susan cannot get into heaven because she starts wearing lipstick). On a more literary level, the tone of the books is weirdly uneven: the narrator is sometimes very intrusive, and Lewis fails where his friend Tolkien succeeded—in creating a world that (whatever we feel about its style) hangs together seamlessly, and convinces us of its reality on its own terms. In Narnia, you can see the stitches that patch a chunk from Mallory to a gobbet from Ovid. Yet there is a reason why so many children love Narnia, and the reason is that the books are, in parts, superb. They have “sensuous vitality” in spades. It is hard to forget Lewis’s wonderfully greedy, detailed descriptions of food (tea with the Faun, fish at the Beavers’ home, the sickly more-ish-ness of Turkish delight), and of weather, landscape, and the feel of things (the Lion’s soft paws, the scabby dragon’s skin in The Voyage of the Dawn Treader, the sensation of riding on a cloud in The Silver Chair). They are also brilliant, on a psychological level, at evoking the mechanisms of temptation—a theme that Lewis understood well in Milton, and which he also developed in The Screwtape Letters. When Edmund eats that Turkish delight, or Lucy looks in the magic book, we can see that the yielding is not just a question of choosing pleasure over duty. Like Milton’s Eve, rather, these characters delude themselves into choosing unhappiness over happiness, by valuing reputation, honor, or knowledge over the things that bring real joy: love and trust. They do it to themselves. What makes Lewis, at his best, a great figure is that he understood happiness (Surprised by Joy, the first line of a sonnet by Wordsworth, is the title of Lewis’s spiritual autobiography); and he also understood how easy it is to reject it. LEWIS’S BITS OF translation of the Aeneid are bad and good in very much the same ways as his Narnia books. Fairly often, especially in the first book, I felt rather sickened, and doubted whether I would be able to get through the whole text, despite its brevity. Lewis’s attempts at “sensuous vitality,” when applied to descriptions of either people or goddesses, are invariably awful. Many couplets hover uneasily between the downright dreadful and the merely silly, as when we are told that Aeneas’s mother, Venus, appears to him “in huntress’ fashion to the rippling air,/Girt ’neath the paps and kilted to the naked knee.” The fake medievalism of the language and chosen meter (a version of English alexandrines, six-beat rhyming couplets) is instantly off-putting. The phoniness alarms go off right away, since Lewis is unable to resist the allure of archaisms evoking a never-never world of the lovely rustic past: the work begins, “Lo, I who in the woodland blew an oaten reed/Of old and taught the neighbouring tilth anon to feed/The hunger of keen husbandmen who loved my lay”—and so, horribly, on. It is hard not to be reminded of Johnson’s damning appraisal of Milton’s Lycidas: “There is no nature, for there is no truth; there is no art, for there is nothing new.” Aspiring to medieval or pastoral earthiness can be a big mistake. But not all of the text is so bad, and parts of it are, like the curate’s egg, excellent. The gory monsters of Book Six are well done, as is the pathos of the world of the dead, where “all was unembodied soul, and thin/Wraith flaunting to the eye and hollow all within.” The battle scenes of Book Two are particularly strong, and remind one of Lewis’s capacity for sharp, tightly plotted storytelling: “Clothed in his terrible father’s might, Pyrrhus comes on./Swords, bolts, and bars avail not. The whole door is gone,/Beat with their ram repeatedly. The door-posts fall;/The entry’s forced; its guardians have been butchered all.” The pace is very fast here, just as it needs to be if it is to echo Virgil’s taut clauses. Fit via vi is more aphoristic than Lewis’s “the entry’s forced,” but Lewis’s version has the virtue of concreteness. So Lewis’s translation is, finally, worth reading, and not just by Lewis-o-philes. 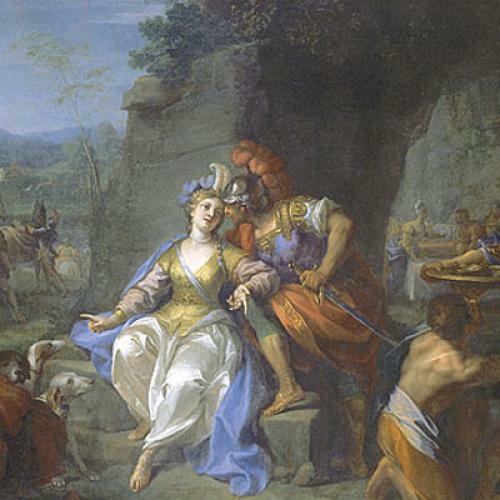 It is a challenge to re-think how we see Virgil’s Aeneid. The unevenness of Lewis’s version is a reminder of just how diverse the original poem is: the ideal translator would be just as good at how the goddess of love might look in a hunting dress as at storms, battle scenes, and the complexity of human emotions, including the prompts for desire and desire to desire. Repression, as Eliot saw, is one subject of the Aeneid, but it is far from the only one. Emily Wilson is associate professor of classical studies at the University of Pennsylvania. She is the author of The Death of Socrates: Hero, Villain, Chatterbox, Saint (Harvard University Press) and translator of Six Tragedies: Seneca (Oxford University Press). This article originally ran in the August 18, 2011, issue of the magazine.